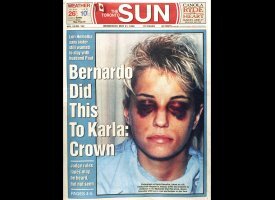 Part 4 covers what happened when the Crown's star witness took the stand to testify against Paul Bernardo at his murder trial. His ex-wife Karla Homolka would spend 17 days on the stand. She testified about her abusive relationship with Bernardo and described how Bernardo alone killed both Leslie Mahaffy and Kristen French. But things got heated when Defence Lawyer John Rosen cross-examined Homolka. Host Kathy Kenzora covered the trial from start to finish and provides her first hand account of the verbal sparring between Rosen and Homolka. All music in this episode written and performed by Lee Rosevere. Hearing Bernardo's voice is surprising. I suspect his is a voice that could easily draw people to him. Gentle, harmless, convincing . . . deadly. Time provides opportunity to re-evaluate. As a reporter you had first had views and formed your own perspective. Share more of that ?